Halloween means different things to different people. Some people can't wait for the chance to dress up like Leatherface and go ripping around the party with a chainsaw and a vest made of human skin. Others live for the day they can join the living dead and ramble around in their zombie costume looking for some tasty brains. For a lot of people the scarier and more gruesome or nightmare-inducing your Halloween costume the better. It's not Halloween unless their costume causes someone to drop dead from fight. But not every one is a fear-inducing maniac and we here at Costume Works want you to know that we get that. We embrace the diversity of Halloween. 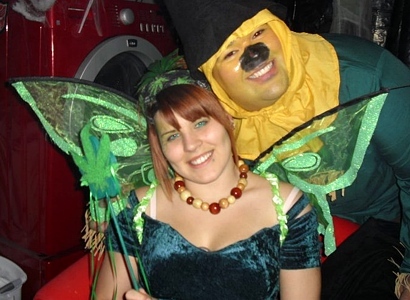 And we include just as many mystical, magical costumes in our Costume Photo Gallery as we do all the other genres. We have dozens of pretty little witches and gnarly little gnomes. 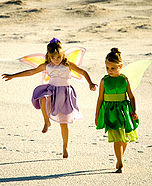 And mixed in among all the wee folk and unicorns you'll find some of our favorites – bright, colorful fairy costumes. The most important part of any homemade fairy costume is the wings. After all, every fairy, whether they're the Good Fair, the Tooth Fairy or a Flower Fairy has wings. You can often pick up some inexpensive, glittery wings at your local discount or dollar store. But you can also take a look through our Photo Gallery for some ideas to make your own. Next, of course, is the filmy, colorful dress. Most fairies are dressed in the colors of flowers but there are some exceptions. 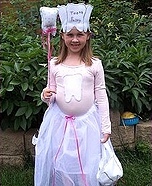 The Tooth Fairy generally dresses in something white because white is the color of teeth. And the Good Fairy who grants all your wishes usually dresses in something very elegant and glittery, with a tiara and a sparkly magic wand. 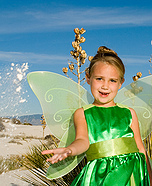 If you're planning to be a real fairy like Tinkerbell (Yes! 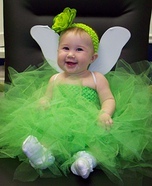 Tinkerbell is a REAL fairy!) 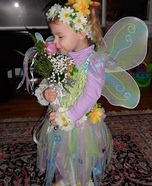 then you need to check out this Tinkerbell costume sent to us by Katie. 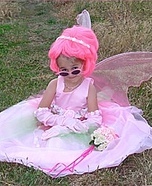 This is Katie's daughter wearing a homemade fairy costume. The wings were made by stretching a pair of girl's tights over some molded, 18-gauge wire. The adorable green tutu requires no sewing at all and the only materials you need are some tulle and ribbon. 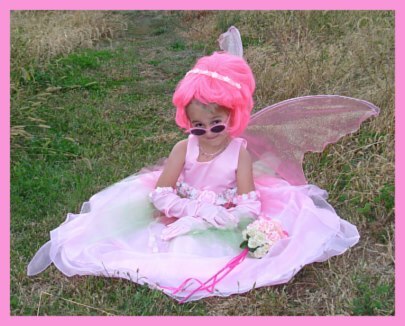 Feel free to tour our Costume Gallery where you'll find plenty of ideas for homemade fairy costumes and you still have plenty of time to design one for yourself. Don't forget to send us a picture and enter our annual Halloween Costume Contest here at Costume Works. We'd love to add your picture to our every-growing gallery! If you don't have the time or the inclination to MAKE a costume this year. If you've thought about it, but your heart, for whatever reason, JUST isn't in it...You can probably purchase a costume of the type you were planning to make... and maybe even for about the same as you might spend on the materials to MAKE a costume.